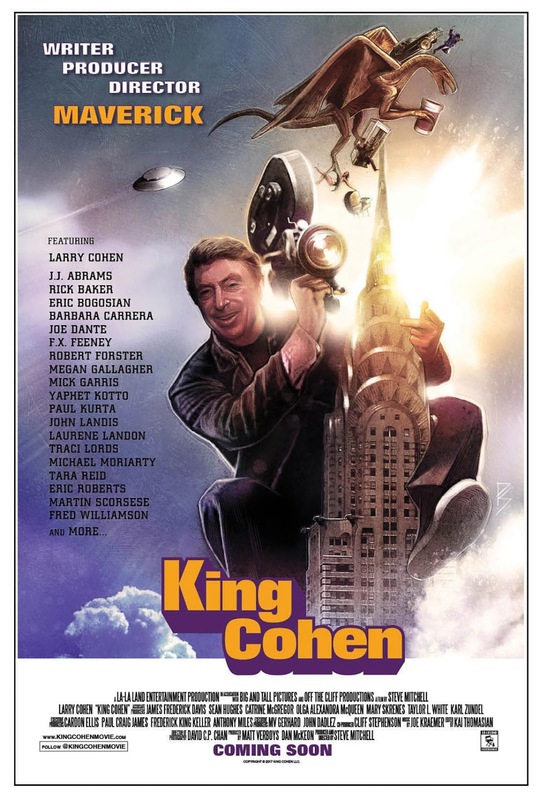 The highly anticipated KING COHEN, the true story of writer, producer, director, creator and all-around maverick, Larry Cohen, will receive a full theatrical run across the U.S - including Los Angeles and New York - beginning 27th July courtesy of Dark Star Pictures. Cohen, best known for resourceful low-budget horror and thriller films that combine social commentary with prerequisite scares and welcome humor, is responsible for celluloid classics including BLACK CAESAR, IT’S ALIVE, Q: THE WINGED SERPENT, and THE STUFF (a personal favourite of mine - Peter 'Witchfinder' Hopkins). He was also a major player in the Blaxploitation films of the 1970s, as well as a prominent Hollywood screenwriter (PHONE BOOTH). We can unveil a brand-new clip from the highly anticipated KING COHEN, the story of Movie Maverick Larry Cohen. In this fun new clip, Cohen, as well as Joe Dante (GREMLINS) and Michael Moriarty (THE STUFF), discuss the filmmaker’s use of special effects in the 1982 classic Q : THE WINGED SERPENT. KING COHEN begins its theatrical run 27th July in markets including Los Angeles and New York. KING COHEN will come to VOD 14th August from Dark Star Pictures.